Rainwater doesn’t cause mud in front of the house. Chickens don’t roost on top. Also, if you live in the suburbs, it should be gorgeous enough to keep your uptight neighbors from deciding that the world is ending. One of my “low houses” with walls just four feet tall and a simple galvanized metal roof. There are no rafters. The roof is attached to the three horizontal purlins at front, middle, and back. Most of my houses have shed roofs made of galvanized steel roofing. The configuration is a “shed roof,” which just means that it’s higher and the front than at the back, so rainwater pours off at the back of the house where is causes less trouble. I prefer using the cheapest corrugated roofing, which is readily available from lumber stores like Home Depot, but you can get metal roofing in all the colors of the rainbow, with baked-enamel coatings that last forever, and in shapes that are less industrial than the corrugated ripple. My roofs are just metal, with no plywood decking underneath, and no insulation. This is appropriate for highly ventilated houses with enough airflow that the inside temperature and humidity are about the same as outside. You don’t have to worry about condensation in such a house. In the old days, corrugated metal roofing was held on by nails banged through the high points of the ripple and into purlins. These don’t hold very well, and were replaced by roofing nails with rubber washerss. The nails are hammered through the low points of the ripple and the washers keep them from leaking. These have more holding power. But all these are going the way of the dodo, because roofing screws have three times the holding power of roofing nails. So use roofing screws and get yourself a good, powerful electric drill or screwdriver for installing them. My houses have purlins but no rafters. The sheet metal is nailed directly to the purlins with roofing nails or roofing screws, meaning that they are supported only every four feet. This has worked well for me. One thing I’ve learned, though, is that if the metal roofing sticks out very far in front of or behind the house, it’ll flap in the wind and work itself loose. So when you have plenty of overhang (which is a good thing), you need to add a 2×4 at the very lip of the roof, under the roofing. Naling the roofing to this 2×4 keeps the sheet metal from flapping in high winds. One problem I haven’t solved is that of keeping chickens from roosting on the roof. Chickens like sleeping as high in the air as they can, and that means the roof. My roofs have a shallow slope and they can sleep anywhere on the roof they want without sliding off. A steeper roof is clearly called for! I haven’t yet done any experiments to discover the critical angle where the chickens slide off. Traditional shed roofs often call for a one-in-four slope. A house eight feet deep would have a roof that slopes down two feet front to back: perhaps with a seven-foot height in front and a five-foot height in back. But even my flattest roofs haven’t collapsed under moderate snow loads, in spite of my lightweight framing. 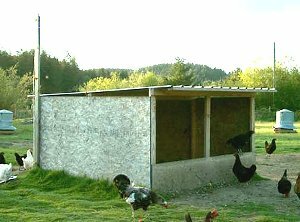 Any kind of real roofing will work fine in a chicken coop: asphalt shingles, cedar shakes, roll roofing, built-up roofing, etc. I’ve never built a structure using any of these, so I can’t provide details. Before galvanized roofing became widely available, most coops seemed to have either fancy shingle roofs or lowly tar-paper roofs. I don’t recommend simple tar-paper roofs because they don’t last long enough to be worth the bother. Roll roofing, which is much heavier, is probably okay. Lots of people use temporary roofing such as tarps for their chicken coops. This is fine for summer pasture houses, and in fact my wife Karen developed a tarp-covered cattle-panel hoop house for pastured broilers. But the tarps on these hoop-coop roofs tend to develop holes during the course of a single season and are iffy as winter housing even in our mild Oregon climate. We used white transcluscent corrugated plastic roofing for our Coop roof. It lets in a LOT of light, which will be good for the girls during winter, and is pretty durable. Ours are screwed in directly to 2x4s that cross the length of the coop — no rafters here. Rafters just seemed like gilding the lily to me, a lot of work for very little extra value. OK. I need to use some sort of reflective barrier at our Nevada place because the heat can go up to about 110 in the summer. Is there a way to do this in an open house?